Who Forgets a Nice KISS? ~ The Fossil Faction gets it. We renewable types? Not so much. Simple messages work more readily for simplistic solutions, sure. But simple, easily grasped messages must also be found for solutions that actually address the problem. 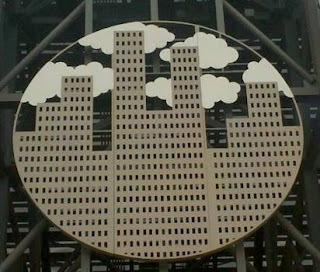 Results are dependent on the substance of policy, support to try implement it only on its image. ~ Today is Memorial Day, when we remember with gratitude those who serve and those who have served, and sacrificed, for our country and for our liberty. Even as we remember the honor of the past, and thank those serving in the present, we fail our soldiers should we forget to secure their future. So many are placed in harm's way because of our debilitating dependence on fossil fuels. Unlike our craven politicians who pander to their oily bagmen, our military leadership knows the vulnerability and is taking action. Below is a slightly edited repost on the subject from 11/27/09. Renewable energy has many benefits, but usually saving lives isn't one of them. However, it has the potential to do just that for the United States military. Marine Corps Major General Richard Zilmer is based in Fallujah, Iraq, and has responsibility for dangerous Anbar province. He and his 30,000 troops generate electricity from diesel generators for cooking, refrigeration, communications, charging batteries and especially for cooling their tents in the 135-degree weather. The fuel for these generators comes over land in long, snaking convoys of slow-moving and vulnerable tanker trucks. 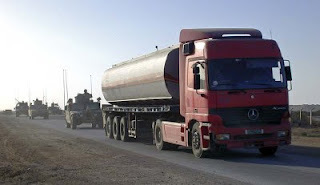 These convoys have been a repeated target of attack and, even with considerable security measures, are extremely vulnerable and very risky for all personnel involved. In an urgent 2006 memo to commanders at the Pentagon, Zilmer warned that US forces "will remain unnecessarily exposed" and will "continue to accrue preventable ... serious and grave casualties" unless they were provided with "a self-sustainable energy solution." 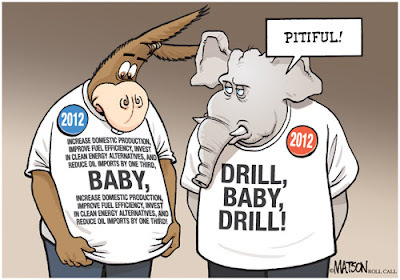 "Obama is Blocking Oil Drilling"
~ There's a lot of political horsepuckey stinking up discussions about energy nowadays. Rhetorical hyperbole is the norm for the election season, now fully underway, but energy is a critical subject. Much of it must be called for what it is—lies. For example, over-heated indignation in some quarters of Congress asserts that US oil production is in decline, and it's—you know!—all President Obama's fault because he is "blocking" domestic oil drilling. And if Obama would just get the gummint out of the way, both more oil and its wondrous benefits to the economy, the American Way, etc. would flow forth. Good rabble-stirring rhetoric, but reality—not. US domestic oil production is indeed declining. It has been since 1970 when we reached Hubbert's Peak domestically. It's been almost all downhill since, exactly as predicted, and the result to be expected any time one systematically depletes a finite resource. 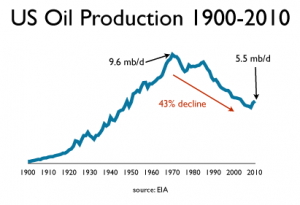 The overall 40-year-and-counting decline in US oil production cannot, obviously, be blamed on Obama. Nor can it be blamed on any president of either political party; it is geology and technology, not policy or politics that is responsible for the decline in domestic oil drilling and production. 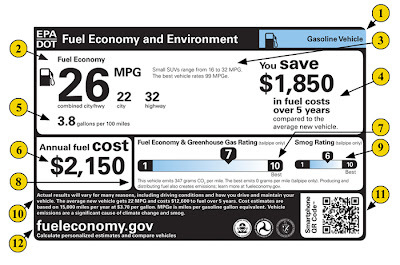 ~ The Environmental Protection Agency and the US Department of Transportation have released details on the new fuel economy labels for cars. While the addition of dollar costs and some kind of emissions information are good steps, the labels are not just stuck on the car, but remain stuck in the past. 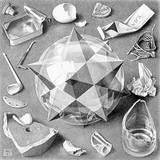 ~ Customer pain, like nature, abhors a vacuum. Entrepreneurs are drawn to painful needs; if it is urgent, compelling and unmet, one can be sure that there will be entrepreneurs competing to satisfy the need and alleviate the pain. The old adage is true: if you have no competition you probably have no market. It is through this lens that one might wonder about the growing spate of entrepreneurial contests: challenges, competitions, thus-and-such of the years, opens... The customers are the entrepreneurs and would-be entrepreneurs, but what is the pain they suffer that these contests assuage? Don't entrepreneurs face enough competition in the market for the product or service that they seek to provide? Why compete against other startups with offerings that target different problems and offer different solutions, i.e. against companies that, in a market sense, aren't competitors at all? The answer lies in another startup truism: the need to carefully define your market, to know who your customer is and what and why they will buy what you offer. 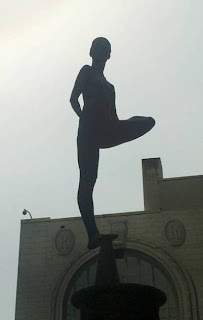 An easier one again (perhaps)... Where in Seattle is this? ~ UW Atmospheric Scientist Cliff Mass was at the Carbon Pricing Conference this past Saturday, connecting the increasing concentrations of atmospheric carbon to climate change and its effects. 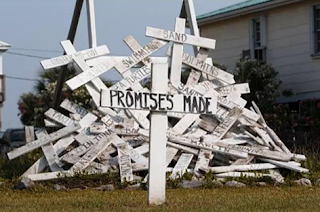 With but the briefest nod to the minuscule sliver with doubts, Mass stated what nearly all credible atmospheric scientists now accept: climate change is real and is at least partially due to anthropogenic causes. While the models are "very good, but not perfect," scientists are "confident that there will be warming, although the magnitude is uncertain." 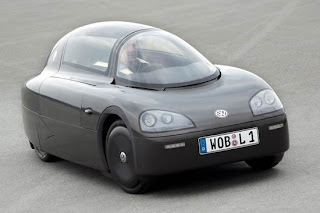 ~ Volkswagen has created a 2-seater car that gets 258mpg. The car runs on diesel; its 1.7 gallon tank can take a passenger 404 miles using a single cylinder engine. While the car is austere in many ways (it is unpainted to save weight) it can still go more than 60mph and incorporates basic safety design and equipment. It probably represents the future of fossil fueled personal transportation. Most amazing of all perhaps is it's $600 MSRP. Of course, that's the sales price in China, the initial market. Even at that price, it will be unaffordable for the vast bulk of the population. No doubt it will cost many times more once it (or something like it) goes on sale in the US. The surprise comes right at the end. These pictures are current, not from a year ago. The Gulf has not recovered. (When) will it? ~ How does one of the most massive bodies of water in the world vanish? 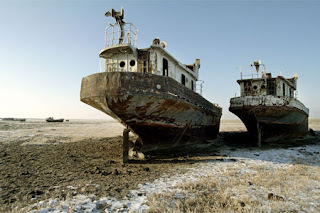 In the case of the Aral Sea, with sickening speed. What was once the world's 4th largest freshwater lake now is just 10% of its former size. The causes are several: misguided economic development that ends up destroying, not creating jobs and economic vitality. Unsustainable practices. Grasping behaviors suggesting this may be an early harbinger of water wars to come. Yet another example of the tragedy of the commons. The practices that are destroying the Aral Sea are not dissimilar to those that are destroying the oceans. Or the mountains. Or our climate. This is a repost from the Hydrovolts blog of 4/6/10. Environmentalists decided to get ’serious’, so as to be listened to in the corridors of power. They started wearing suits and pretending to be economists and speaking the language of business and science. It was a perfectly sensible approach in many ways, and it yielded many clear dividends. But it may also have doomed the greens in the longer term, for now they find themselves caught in a narrative of other peoples’ making. What If We Had More Than We Could Use? Our overly damp spring weather has provided an abundance of hydropower. 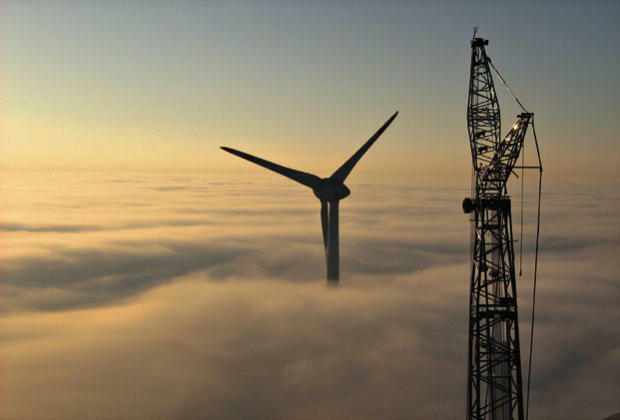 There's so much that the creaky and antiquated electrical grid cannot take all the power wind turbines are now poised to generate. 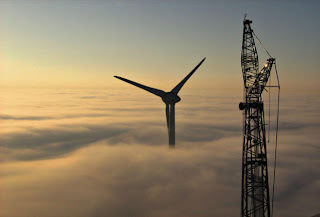 So the Bonneville Power Administration (BPA) which manages the grid, is shutting down wind turbines. If the turbines don't operate, they don't produce the power that in turn generates the income that pays for their financing. Thus, wind is made less feasible because of a surfeit of hydro. ~ This Saturday there is a conference at the University of Washington to explore the costs and benefits of different approaches to pricing carbon. Carbon is a huge externality that distorts the economics of energy, and, because energy is a critical element in virtually everything else, carbon is a huge externality to our economic system both broadly and deeply. The Conference will be held in Room T439 at the UW Health Sciences Building from 9:00 to 3:00 and has a great speaker list. Two of many are engaging PSE CEO Kimberly Harris and the very knowledgeable Professor of Atmospheric Science Cliff Mass. 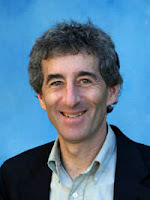 I'm also greatly looking forward to seeing again Yoram Bauman, the world's only "stand-up economist" who can truly make economic analysis not only very funny, but also very understandable. The key idea: most of the web sites and services we use do not provide us an unfiltered stream from the Internet. Much is hidden from us, and the implications are disturbing for a democracy that depends for its vitality on a generously informed electorate. ~ Today was surprisingly sunny and warm. I got a bit sunburned mowing/edging the lawn, turning the rest of the vegetable garden, composting, weeding and getting more of the spring planting done. This year we've planted potatoes, carrots, beans, peas, radishes, onions, tomatoes, squash, pumpkins, cucumbers, corn, peppers, cauliflower, and cabbage. Many herbs too. A few last stragglers, especially broccoli, still to be done. 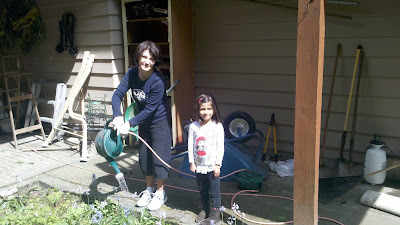 My wife and I are teaching our granddaughter how to garden. It matters, I think, that our children and grandchildren understand where our food comes from. It also matters that they experience how much work it is to build, maintain and harvest a garden. In a future where petrochemical inputs for food production are more limited and more expensive, we may all be growing more of our own food. 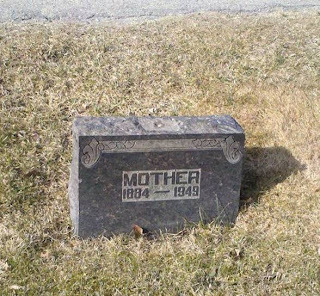 ~ Short, funny, and right on target. They may cheat at Pictionary (!) but the picture they draw is devastatingly clear—Americans and American values come second to rapacious capitalism and the relentless March of the Fossils. ~ Higher energy prices typically lead to calls for increased supply which should, in classical economic thinking, bring prices down (all else being equal, which it rarely is.) But there can be other costs to consider before blindly increasing supplies by any means. 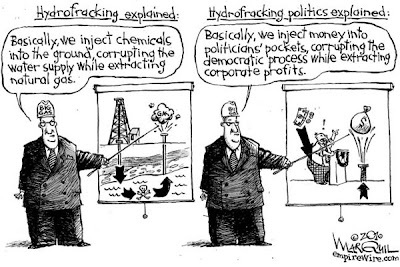 In France, they are poised to ban hydraulic fracturing (fracking) regardless of the potential to add energy supplies because the environmental costs are too great. The ban would reverse its earlier permission of the practice, which had been given so hastily that there wasn't even opportunity for public input. Was last week's too hard or are both my readers spending too much time on the computer?! 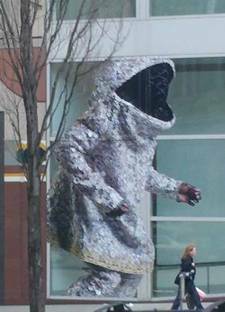 Anyway, new this week... Where in Seattle is this? ~ Not the greatest production values, but entertaining nonetheless. One of the politicians so ably mocked in this video is Senator Richard Burr (R-NC) who last week introduced a bill to abolish the EPA. He is part of the growing climate zombie caucus in Congress. Zombies? Yes: moving catatonically in a herd, lacking much in the way of reasoning abilities, largely ignoring the environment around them, single-minded in their vile pursuits, oblivious to the horror they provoke, and almost completely undeterred by attacks against them. 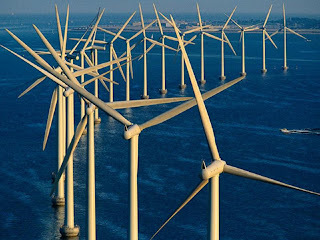 ~ Even as Congress pushes for more drilling more places with fewer restrictions and less oversight, offshore wind is having its sails trimmed. 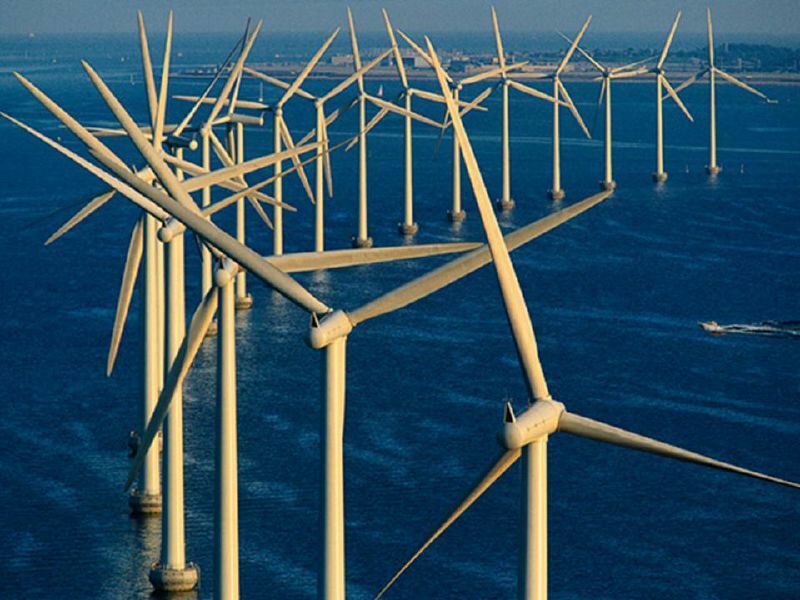 The Bureau of Ocean Energy Management, Regulation and Enforcement (BOEMRE) has announced that it is reducing the area under consideration for future commercial wind energy leasing on the Outer Continental Shelf (OCS) offshore Massachusetts. This reduction is in response to multiple comments received in response to a Request for Interest (RFI) issued on December 29, 2010. In response to the RFI, BOEMRE received nearly 250 comments, including several from the Massachusetts commercial fishing community, the Governor’s office, and the congressional delegation, which argued for the reduction of the area under consideration. The public, embracing the usual amnesia, now strongly favors increased offshore oil drilling, even though a majority doubt the federal government can prevent another disaster like the Macondo Deepwater Horizon, almost all think the Gulf of Mexico has not recovered and more than a third think it never will. ~ Congratulations to grads everywhere, and especially to my great daughter, now the proud possessor of a BA in English (and minor in Religious Studies) from Lewis & Clark College. Although rainy it was all most festive. Strange to harken back to my own graduation a million years ago. Same nostrums to the graduates about following passions, risking failure fearlessly, being the hope for the future, changing the world, and, of course, staying in touch with the alumni office. Can this generation fix some of the world's pressing problems? Let's hope so; there's plenty from which to choose. Nostalgia for the Past, or Hope for the Future? ~ May 7 is National Train Day. Here in Portland the day was marked by festivities at Union Station, including the display of a famous steam locomotive. The use of a vintage engine of yesteryear is appropriate, and instructive. How much better it would be to feature new technology that represented the future of rail travel, such as modern, energy-efficient trains, or even high-speed rail cars. Alas, high-speed rail in the United States, while envisioned and nominally funded, remains a distant prospect. While China and others continue to invest heavily in new rail, many in our Congressional leadership remain hostile to infrastructure, especially trains. When you sat down to lunch and saw a salt shaker on the table, I bet you didn't ask yourself where the salt came from. You didn't wonder whether or not we are 'salt independent.' You didn't think about it at all. 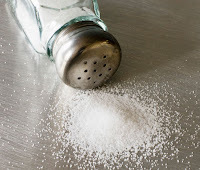 Salt has been used since ancient times to preserve food, especially meats, from rotting. Cities have been built to exploit salt resources (Liverpool) or have become global centers of trade for salt (Timbuktu). Wars have been fought over salt. It was once an incredibly important and mostly irreplaceable commodity that commanded high prices. It was like oil is today. Electricity did not make salt go away. It just made it boring. That should be our goal: make oil boring. Indeed. Imagine a day that no one fights over oil, or expands blood and treasure to secure it. Exactly as we found a better and more plentiful way to preserve our food, we can find a better way to provide our energy. And just as was true when electricity displaced salt, when we replace oil with sustainable, renewable energy, we won't want to go back. ~ What stage are we at now? Based on Congress' impotent and ignorant fulminations, anger. 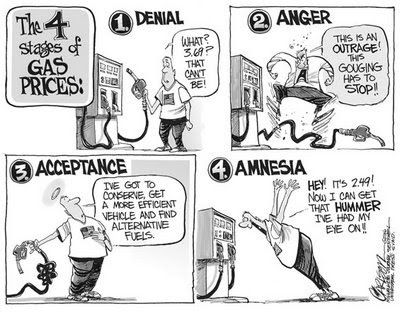 If we're lucky, we'll reach stage 3 during the 2012 elections and stay there long enough to implement an intelligent response before we lapse into the old torpor. Too easy again last week! So, here's a harder one... Where in Seattle is this? 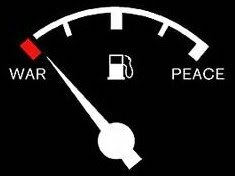 ~ A friend writes that there is actually good news in higher gas prices. As oil and gas prices spike, renewable solutions become more feasible. The cynic in me, however, remains cautious. Gas prices always seem to come back down before any concerted effort at finding renewable energy ever comes to fruition. Is it a conspiracy? Probably not, but then it isn't an election year. ~ Further details of what happened will be interesting, to say the least. Initial thoughts: the silence from Pakistani leadership is deafening; they don't look good. He was living comfortably in a villa in one of their larger cities, and apparently they were not involved in the operation, and perhaps likely didn't even know of it in advance. Obama gave them cover in his announcement, but there's doubtless some really pointed chatter in private. Faux News is absolutely squirming delivering this news. If a Republican were president, there would be endless praising of leadership. With Obama, rather muted, and of course, a try at giving credit to Shrub. Such a bitter pill for them. So the US has his body. What on Earth are going to do with it? 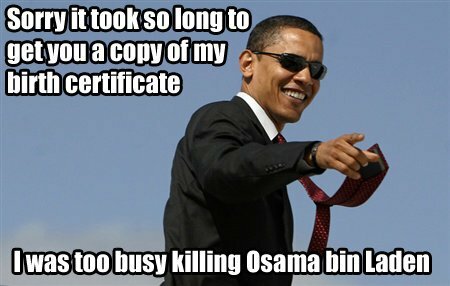 Whatever they decide, expect withering criticism of Obama for it.